Here we go again. Under pressure domestically? Opinion polls down the drain?Need to boost yout tight-on-immigration stance? Blame Schengen, the source of all ills! Sarkozi docet (http://www.wat.tv/video/sarkozy-villepinte-accords-4xhqz_2exyh_.html). Hmmm, didn’t the French government play the very same political card not that long ago? Remember the temporary closure of the border with Italy aimed at preventing the ‘orde’ of North Africans fleeing the turmoil caused by the Jasmine revolutions? The French, of course, are not the first, and probably not the last, to acquire this sudden revulsion of all things Schengen . The Danish for a while showed signs of this condition too (before the newly elected centre-left government managed to contain it), and others have periodically been affected by it – even if just in its milder forms. Schengenitis, however, is not a novel ailment. The roots of the current strain can in fact be traced back to the very early days of Europe’s border control regime in the early 1990s. Then, as today, European capitals (Paris in primis) maintained an ambivalent stance vis a vis Schengen, on one hand supporting the project’s objective , and, on the other, dragging their feet in the implementation stage.In this period, for example, the French government (then as today of right wing leanings), citing other members’ laxity, periodically relied on the regime’s ‘special circumstances’ clause to maintain or reinstate internal border controls. In these early cases of Schengenitis, however, the regime not only managed to withstand existing tensions, but its body and ‘spirit’ came out reinvigorated. 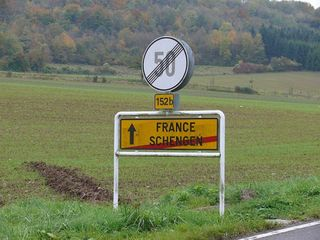 In the second part of the 1990s, Schengen expanded to new members and was officially incorporated in the European Union’s institutional framework. Thanks to the regime’s institutionalization and expansion, Schengen today is even hailed as one of the most visible achievements of European integration and a key pillar of European Union’s political architecture. Will history repeat itself? Will Schengen not just survive, but emerge once again unscathed from the ailments that periodically affect it? Some contextual factors seem to cast doubts over this optimistic vision for the regime’s future. The latest strain of Schengenitis has in fact emerged in a political climate that is rather gloomy. The inward looking attitude of a growing swath of the electorate across Europe and the parallel rise of xenophobic political movements, together with the fear of further enlargement of the regime and, more generally, a steady decline in support for further European integration, have seriously curbed the enthusiasm for the border free Europe project. Despite the current sceptical political climate in Europe, there are some signs that the resilience that Schengen demonstrated in the past is still present today. Throughout the recent epidemics, European policy-makers, side by side complaints, criticisms and reciprocal accusations over the handling of North African migrants, have repeatedly emphasized the achievements, both practical and political, that Schengen has accomplished over the years, and its fundamental importance for the European integration project. Crucially, they have also vowed their allegiance to the regime and their commitment to support it in the future. Does this state of affairs mean that Schengen “will never die”, as Charles Elsen, former Director General at the European Council’s General Secretariat, predicted on the eve of the regime`s incorporation in the EU in the late 1990? Probably not. After all, all policy projects, like the individuals who create them, are bound to get old and eventually pass away. Schengen is no exception to this rule. Its periodical ailments and the healing periods they require are testament to its mortality. As it has been the case in the past, however, Schengenitis seem to be still treatable. Europe’s border control regime is therefore likely to live on for some more time to come, pace Sarkozi.